As a knee and shoulder specialist with an immense experience in arthroscopic surgery, Dr. Armin Tehrany is often asked to introduce the exciting orthopedic challenges to medical students, as well as all students interested in medicine and orthopedics. Manan Patel is a young man whose father is one of Dr. Tehrany’s patients. Manan graduated at the New York University last year, and now, he is particularly interested in applying to medical school. Manan’s father had a shoulder surgery that went perfectly smooth, enabling Manan’s father to heal from his shoulder trauma without further complications. 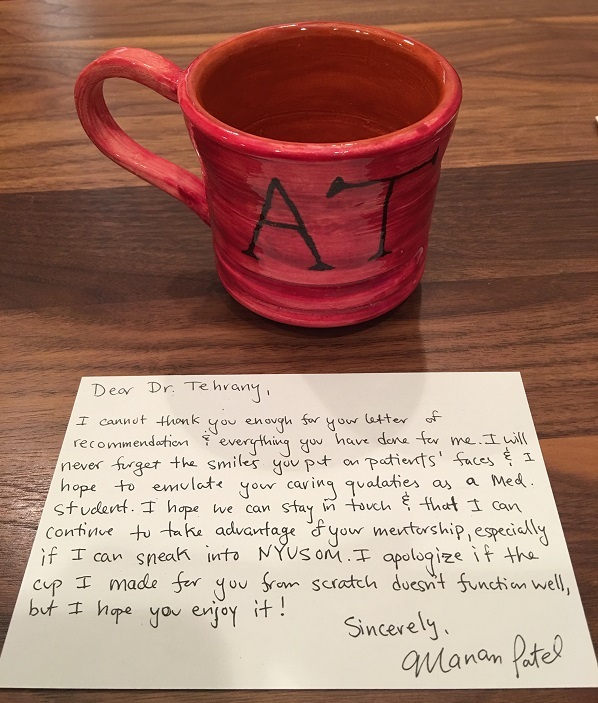 Dr. Tehrany recognized a glimpse of himself in Manan’s eagerness to learn medicine, and as a result of that, he wrote a recommendation letter for Manan’s application at the New York University School of Medicine. As a gratitude for Dr. Tehrany’s recommendation, Manan brought a gift and wrote an endearing letter for Dr. Tehrany. “I met Dr. Tehrany through my father, who had a shoulder injury. Not only did Dr. Tehrany treat my father without any further complications, but he also took me on to shadow him, which allowed me to see Dr. Tehrany interact and treat his patients. I was compelled to write one for Dr. Tehrany because he is one of the most caring physicians I have met. I’ve never seen a physician who spends as much time with his patients, making sure to plan a treatment that meets the patients’ lifestyles and needs. You will not be just a number to Dr. Tehrany, but rather someone who he deeply cares to see improve in health. Dr. Tehrany is meticulously skilled in the operating room as well. I have met many patients who cannot believe Dr. Tehrany operated on them—patients who said they were in unbearable pain before the operation and couldn’t imagine the progress they were making in their movements post-operation. For me, Dr. Tehrany has been a tremendous mentor who is eager to teach and improve the profession that he says gives him the greatest joy and satisfaction. His dedication to his patients, to his profession and to his community makes him a physician you can trust to have your best interest in mind. The lessons I have learned from him have been priceless and I plan to emulate his qualities as I begin medical school this fall.